Saturday was one of California's two 'free fishing days' where you don't need a permit to fish. 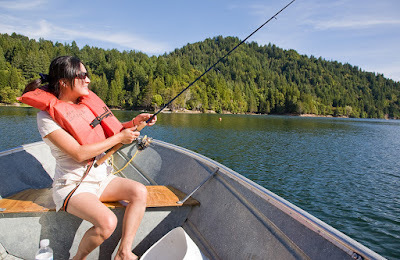 Kim did some research and discovered a reservoir in the Santa Cruz mountains called Loch Lomond Reservoir. The place turned out to be a pleasant surprise, not too many people, nice quiet lakes where larger motor boats aren't allowed. 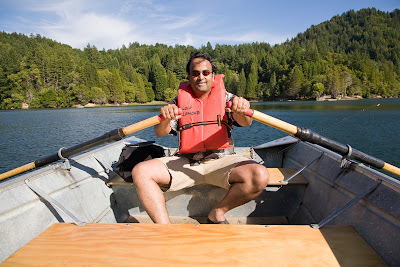 We rented a row boat and did a combination of fishing and rowing for a few hours. I had also heard that this was a good place for bird watching and though I wasn't looking very hard I spotted a Stellar Jay and a Kingfisher. Though we didn't catch any fish (very few of the other folks on the lake managed to catch fish) it was still a nice way to spend a Saturday afternoon/evening.